Be the first to share your favorite memory, photo or story of Sun. This memorial page is dedicated for family, friends and future generations to celebrate the life of their loved one. 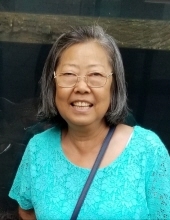 Sun Ae Zalusky, 61, of Aberdeen, MD, passed away March 15, 2019 at University of Maryland Shock Trauma Center. Born in South Korea on May 25, 1957, Sun Ae was the daughter of the late Kim, Yong Sok and Cho, Han Sun. She was an active member of her church and was an excellent cook who enjoyed preparing meals for her family and friends. Sun Ae touched the lives of many people with her smile and generosity. More than anything, she was devoted to her family and her strength and kind heart will be missed. Surviving to cherish her memory are her husband of 40 years, Richard Zalusky; 4 daughters, Sandra, Linda, Emily, and Maryann Zalusky; 4 grandchildren, Amaya, Tamia, Alyssa, and Keema; 2 brothers, Kim, Sok Su and Kim, Sok Chol; and 4 sisters, Sun Hwa Wentz, Sun Sim Kim, Sun Tok Kim, and Sun I Behnken. Services honoring her life will be held at 11:00 am on Thursday March 21, 2019 at Tarring Cargo Funeral Home, P.A., 333 S. Parke, St., Aberdeen, MD 21001 with visitation beginning at 10:00 am. Burial will be in Harford Memorial Gardens. To send flowers or a remembrance gift to the family of Sun Ae Zalusky, please visit our Tribute Store. "Email Address" would like to share the life celebration of Sun Ae Zalusky. Click on the "link" to go to share a favorite memory or leave a condolence message for the family.